Q: I am having trouble with WordPad in Windows 7. It’s set up to give me two lines between sentences. How can I change it to give me one line between sentences? A: With Windows 7, Microsoft changed the menus in both Paint and WordPad. Instead of the familiar pull-down menus along the program’s top, the programs now sport a large button-filled bar known as a “ribbon menu.” Some people love the new menus, others hate them. But love ’em or hate ’em, they require some figuring out before you can get some work done. When you click the button, a menu appears (left), letting you change the line spacing to meet your needs. Tip: To see the purpose of any menu button, rest your mouse pointer over it. A box appears, offering an explanation of what that button accomplishes. Update: But what, you may ask, if you want to remove that blank line that WordPad places between paragraphs? To do that, choose the last option from the line-spacing menu: “Add 10pt space after paragraphs.” That removes the checkmark, telling WordPad to stop placing the extra space between paragraphs. Tip: To stop WordPad from adding in its blank line after your current paragraph, hold down the Shift key while pressing Enter. WordPad starts the next paragraph immediately after the first, without adding an extra line. That trick comes in handy when creating tables or charts, for example. Update: If you’re tired of using WordPad’s built-in workaround tools, the HoldKey website offers a small registry tweak program that fixes the line-spacing problem. 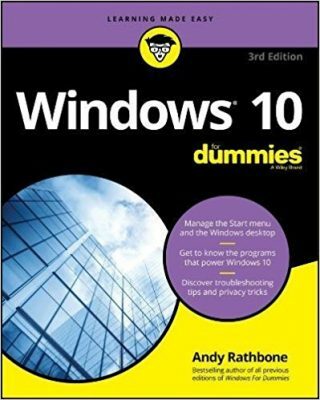 Posted: November 12th, 2009 under Windows 7. I think the wordpad of win 7 – 64 is a useless program. I copied the map – programs / accessories — with wordpad in it from my XP version, made a shortcut and pinned it to the taskbar. Works like a sunshine….! How can I make this change of paragraph permanent to disable the add 10 pt space function ? I prefer to press Enter twice if I need more space between paragraphs. I cannot find any button to click to activate the desired change forever. Each time the PC is turned off, the same procedure has to start up. Ronny, I don’t know of a permanent way to disable the 10 pt space function. There’s probably a way to do it by editing the registry, but that’s too advanced for most readers. If you have a friend with a Windows XP PC, try Jan’s tip above. That copies Windows XP’s version of WordPad to Windows 7, which lets you keep the old program’s features. The single point spacing between lines is still ridiculously large. The XP pad worked seamlessly. Did they sit down and think – “how can we screw this up”?? Well, my Anti-Virus program just declared my old C-WordPad program to be malware . So, I thought I would give Windows 7 WordPad another shot. It’s not looking good so far . I agree, I HATE automatic, unchangeable preferences. Once I set it, it should STAY that way until I change it . What’s so hard about changing the registry ? Do you actually have some reg data available ? Providing a .Reg file for the squeamish is a easy, no-brainer solution . I have over 100 reg tweaks, just to make Windows work as it should . I’ll take a look to see if it’s easily decipherable . Thanks for considering this option . Jim, I don’t have any registry tweaks for WordPad’s line spacing, but please share them here, if you come across them. Thanks! or post files here , so I’ll just dump the instructions in one message . there’s no “Preferences” menu per-se . ALL the settings go back to the built-in default settings . Fortunately, the “Templates System” is still there in the New WordPad . Here’s a way I found that changes the default Preferences . Create a new “Rich Text Document” in a blank space on your desktop . Adjust all the preferences to your liking . This will be your new Starting Template for New rtf files . It also will be the default settings used by WordPad to edit existing files . your new preferences will be automatically applied to any editing you do . now click on “Read Only” , then “Ok” . even though I’ve done it million times it’s still a big pain in the rear . I don’t know if this trick will work if you place the Template elsewhere . Wouldn’t hurt to try, but it might not get a result . according to the guy that found this solution . Make a new “Text Document” ( a txt file ) . Close and save the file . Most people have their file extensions hidden, this is the default setting . Un-Check “Hide Extensions for Known File Types” . then execute rtf.reg (double click it) . Thanks for the link to Holdkey. Is that a registry fix for the problem bundled as a freebie program? Have any of you readers tried it? why is 7 word pad space between lines more than vista ? Jim, Windows 7’s version of WordPad contains significant changes from Windows Vista’s version of WordPad. The most obvious is the new ribbon interface replacing the drop-down menus found in Vista’s WordPad. As for the line spacing change, there’s no way to know whether that’s a bug or a deliberate change on Microsoft’s part. Windows XP and Windows Vista both had a WordPad that worked perfectly. All this added jazz in Windows 7 WordPad is messy, confusing and unnecessary. IF IT AIN’T BROKE — DON’T FIX IT! What on earth were Microsoft thinking when they fubarred WordPad in Windows 7? Instead of messing with programs that actually work (yes, there are one or two! ), why don’t they fix long-standing problems, like the mess they call Windows Update? 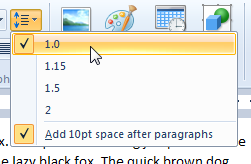 Wordpad in Win 7 is just a reflection of Microsoft’s childish arrogance. I don’t use Wordpad, I use the Jarte editor which is superb and is everything Wordpad is deliberately not. And it is free. I agree – why in the world did Microsoft change Word Pad. It was fine the way it was – simple and easy to use. 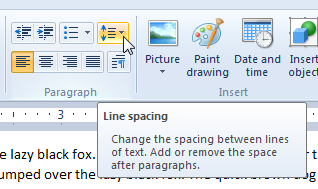 Now each time you want to type a new document, you have to change the line spacing to single space. How stupid that the creator of this Word Pad would choose 1.5 spacing as the default. Yes, why mess with a program that worked fine. Just wanted to thank you for being there. I read the comments after following your instructions but not being successful. I tried the Jarte editor and everything is now wonderful and no double spacing…. The easiest solution for end users would be for Microsoft programmers to include a Preferences menu where you could easily modify default formatting for new documents. But hey, that’s just my wacky, crazy idea. Why inconvenience a few programmers at the company that made the software when instead you can make hundreds if not thousands of your customers jump through ridiculous hoops to accomplish something that should be very simple? Changing the registry to fix Wordpad’s formatting errors did not work for me, however, three other options did. Here they are. 1. wordpadfix for Win7 located at: http://www.holdkey.eu/wordpadfix.php worked like a charm. I copied the entire Accessories folder (which contains four files) over to the C: drive on my Windows 7 machine. I placed it on the C: drive under c:\accessories\ I then right clicked on wordpad.exe and selected the “Pin to Taskbar” option. Viola! It worked. My old version of Wordpad was now pinned to my Windows 7 taskbar and now a single click brings it back to life whenver I need it. I now have a simple, easy to use program to write quick notes and to type out addresses, without all the other garbage Microsoft overloaded the new program with. 3. I created a template document for Wordpad that had only a single space it. I then typed CTRL A and formatted it to my liking (adjusting font, line spacing, margins, etc.). I followed that by saving the file as template.rtf and put it in my documents folder. Though you can put anywhere you want. I then right clicked on template.rtf, selecting PROPERTIES and set the file’s attributes to READ ONLY and clicked OK. Setting it to “Read Only” prevents you from accidentallly modifiying it; however, it doesn’t prevent you from deleting it. Now, whenever I want to use Windows 7’s version of Wordpad, I load template.rtf and everything is set exactly how it like it. When I’m finished, I select SAVE AS and rename my new document to whatever I want. Which fix do I use the most often? The old Wordpad from my Windows XP machine. It’s simple and uncluttered. I do like the PREVIEW print function in the new Wordpad; however, I only use it when I’m writing a long document like a letter. It’s too bad Microsoft went overboard on the changes they made to Wordpad. Unfortunately, Microsoft has not learned the lesson that more does not equate to better. I want spacing less than 1 in wordpad. Surely there is a simple way to do this without downloading a bunch of stuff I don’t understand! 6. Under “Open With…”, select to change. it will use XP wordpad.